All speedsurfers know downwind is faster than halfwind and going deep downwind is often faster than surfing only 10-20° off-wind. Okay, but what are we doing in reality? If you have a free area you can stay halfwind to build up pressure in your sail and then you turn downwind and make your Run. 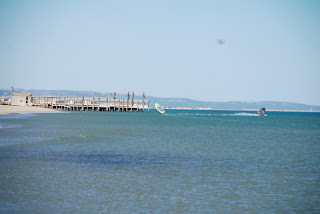 Many speedsurfers are going 30°-40° off-wind, even more is possible (and very fast) but it becomes really technical. Sounds good, but there are very limited spots where you can go really fast and sail the course you like. Mostly you are surfing along a sandbank, a wall or something like that. Beh ind these banks the water is normaly really flat and perfect for speedsurfing, but it is really important in which angle the wind blows to the bank. We like to go downwind, but sometimes the wind blows halfwind or only a few degrees downwind. The water is now superflat behind the bank but for a better course you need to bear of from it into more choppy water. [Picture taken by Ant Baker] This is working really good for 10sec. 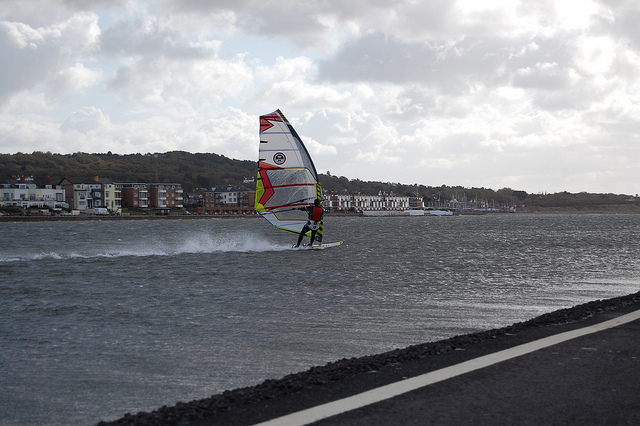 runs and topspeeds as we could see for example at West Kirby 2 weeks ago, but good 500m speeds are very difficult to do. It would be much better if the wind blew really downwind to our bank. In this case we would have a nice angle and could make use of the flatwater. Really? It is only partly correct, because if it starts blowing too much downwind we get something called "rolling chop", this happens especially if the wind is very strong. 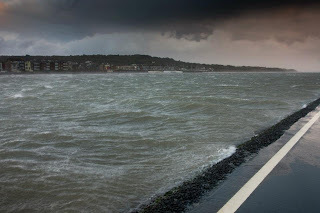 As you can imagine on this picture, which shows West Kirby a few hours later than the first one [Source: http://www.redsurfbus.com/], rolling chop can be really difficult to handle and forces a lot of crashes! Steve Thorp managed his big 50 at the beginning of his run, but th e rolling chop made it very difficult to do just a good 10sec. run. 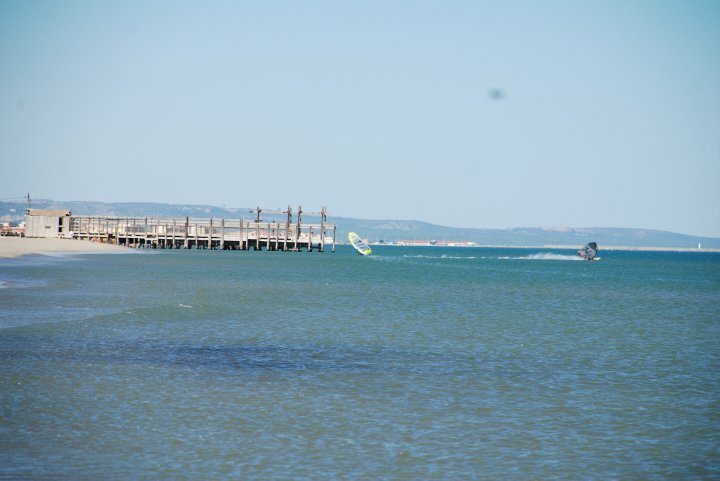 Loosing control because of the chop is not the only problem, our speedsurfing equipment produces less vertical lift on broad courses which makes it harder to keep the board flying. Instead of accelerating the board starts to decelerate. Maybe there are some spots which you can use in superbroad and windy conditions without getting too much rolling chop. 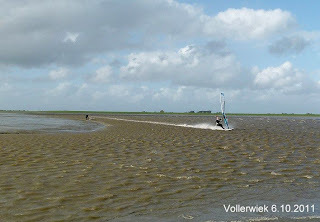 Vollerwiek seems to be one of this spots, the following pictures was taken in 30knots+ conditions and a course of 130° [Picture taken by Thomas Döblin], for me it looks pretty good, but I don't know what you get with 40knots+ and 140°. A perfect solution for the rolling chop problem are probably curved beaches, but there are only very few ones. The second best option could be a windy course which is not s uperbroad. La Franqui for example isn't superflat all the time but there are really windy days with 40+knots and the wind blowing 20°-30° downwind where the water is flat. [Picture taken by Hans Kreisel] In these conditions you can go very fast along the beach and sometimes you can bear of to get even more speed and a nice 10sec. run. 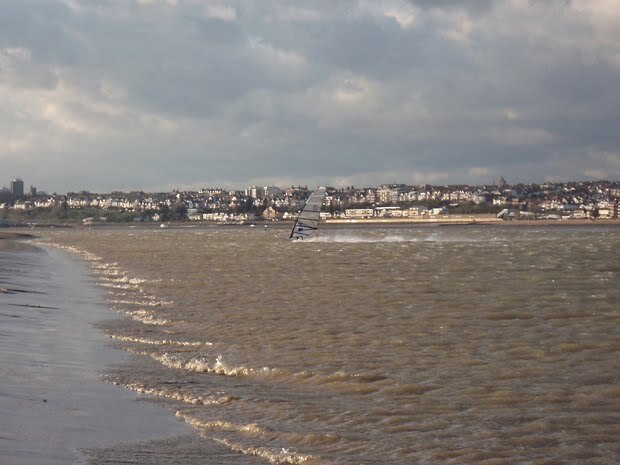 Because you can do very high speeds on the flat course anlong the beach here it is possible to set very high 500m speeds, although nautical miles over 40knots are possbile! Nice article Patrick, I have just finished my first speed comp with 500m courses. 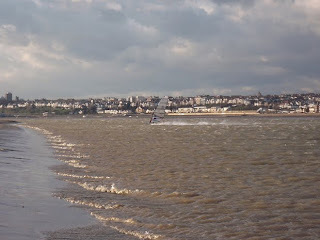 The chop and angles were a problem and I have a lot to learn, I bore off the wind too much on my fastest run and sailed an arc which slowed down my 500m speed. If the course/land is curved allowing you to bear off over a distance then doesnt this often cause the wind to shift so that it is always 90deg to the land?.......This happens a lot where we sail. You don´t get much rolling chop, if you use an extremely narrow canal like in Lüderitz last year. In 2010 the canal was only 3m wide. This year it´s as double as wide = 6 m.
Will be interesting how much the rolling chop increases this year.